For Fathers’ Day weekend 2014 Jane and I planned our first camping trip of the year. For the last three or four years we have gone camping; however, we discovered that this is a popular choice for many fathers in the state of Colorado. Now that Jane is retired, however, we felt we were safe to secure a national forest campsite if we departed early on Friday as we would arrive ahead of those who had to work on the last day of the work week. After a brief discussion we settled on Spruce Grove, a nice campground along Tarryall Creek in Pike National Forest. We packed most of our gear on Friday morning and then headed to the supermarket for some last minute food. Upon our return we loaded the remaining items and began our drive to the southeast corner of Park County. We camped at Spruce Grove quite a few years ago, and it remains one of our favorite campgrounds. There are 20+ campsites in total but seven of them are walk-ins in one of the nicest settings in Colorado. From the parking lot one hikes down a short path and then crosses a footbridge and encounters five sites on the north side of Tarryall Creek. Huge boulders loom over these sites while sweet scented ponderosa pines are scattered among the area. The forest floor consists of coarse natural reddish gravel. Jane and I both had our hearts set on revisiting one of the walk-in sites, but when we arrived, we discovered that they were all occupied or reserved. Next we cruised the drive-up sites along the road that circles through the campground, and these were all reserved or taken as well. We couldn’t believe our bad fortune, or was it really a lack of planning? We resolved to make reservations for future trips or at least check campground availability. With Spruce Grove out of the picture, we moved into crisis mode. My backup option was Round Mountain just off of U.S. highway 24 five miles beyond Lake George and one-third of the way to the top of Wilkerson Pass. We used a shortcut to avoid returning to Lake George and found Round Mountain less than .5 mile down the pass toward Lake George. We held our breaths as we entered and circled the campground, but we were relieved to discover quite a few empty sites and eventually settled on site number 13. After eating lunch and putting up our tent, we decided to enjoy a bike ride. I was familiar with Eleven Mile Canyon, so I suggested that we ride from the entrance hut to the dam and back since it is a very gradual grade. Jane agreed, and we had a great time carrying out this plan. We began a mile or two beyond the entrance gate and probably biked a total of 14 miles. Of course as we cycled along the beautiful stream as it cascaded through the narrow canyon, I noticed that the flows were high, but the water was quite clear and many spots beckoned as high water fish-holding locales. On Saturday Jane and I took a two hour hike into a different canyon location, although this experience was the opposite of Eleven Mile Canyon as we encountered only one other party of five during the entire round trip. 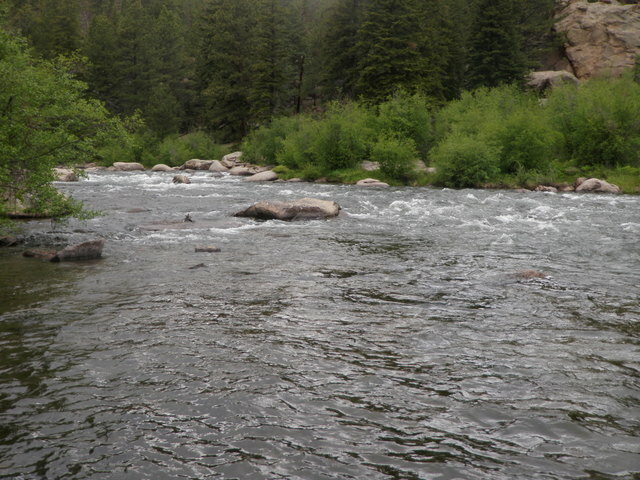 In the afternoon Jane agreed to accompany me back to Eleven Mile Canyon so that I could test the waters for a few hours to see if my observations of Friday would deliver some fishing action on Saturday. By the time we drove to Lake George and purchased some propane to break a twenty dollar bill and secure some ones to pay our entry fee it was 2PM. We drove up the canyon to just beyond the twin tunnels amidst significant weekend traffic and many fishermen. I climbed into my waders and strung my fly rod and then descended the steep bank to the river, and I was finally in a position to begin casting by 2:30PM. I spotted a pair of fishermen below the car, so I hiked up the road a short distance before dropping down the embankment thus allowing a 50 yard buffer between me and the two fishermen below. I was convinced that the higher flows (250 cfs) would cause the fish to recognize worms and scuds in the water column, so I tied on a chocolate San Juan worm and below that added a pink squirrel that I purchased at Driftless Angler. I fished this combination with a thingamabobber and split shot, but despite covering some very attractive water, I had no success. I began cycling through alternative offerings including a beadhead hares ear and a salvation nymph with equally disappointing results. As I was covering the likely runs, riffles and seams with my nymphs I spotted a swirl above me in some relatively slow moving shallow water, so after 45 minutes of futile prospecting with nymphs I decided to switch to dry flies. Shortly after seeing the swirl I spotted a yellow sally that launched from a willow along the river and then dapped on the surface in front of me several times. Could this be what provoked the earlier rise above me? I switched to a double dry fly set up with a Chernobyl ant and a muggly yellow sally. This pairing was as unproductive as the nymphs had been, so I removed the yellow sally and resorted to my “go to” beadhead hares ear nymph. As the day advanced into late afternoon, some gray clouds appeared and blocked the sun. 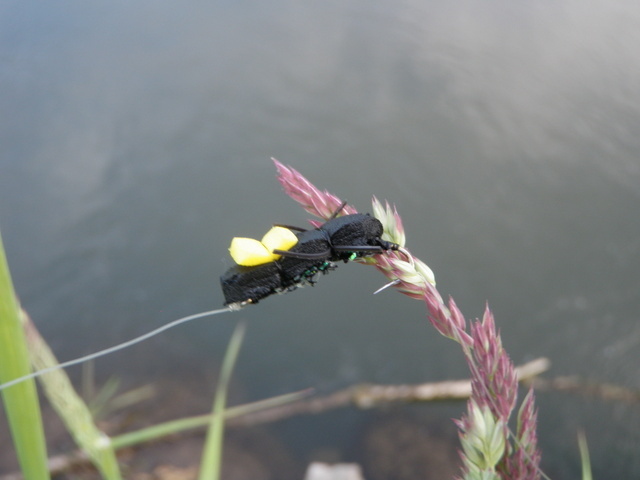 This created difficult lighting conditions, so I elected to switch the Chernobyl ant for a tan pool toy thus making it easier to follow my flies on the riffled surface of the river. A bit after this change I clipped off the disappointing hares ear nymph and substituted an emerald caddis as I spotted two or three caddis fluttering about along the bank. I chose emerald thinking it might be more visible and attract some interest. Sure enough at 3:50 as I was considering an ascent of the neighboring steep bank, a ten inch rainbow grabbed the caddis pupa as it began to swing at the end of the drift. I was resigned to catching no fish, so this was quite a windfall late in my fishing day. After I released the rainbow, I reeled up my line and found a steep path to the dirt road where I found Jane still in the Santa Fe reading her book. I expected Jane to be riding her bike down the canyon, and she still wanted to explore that option, so we agreed to drive further up the road to a point within a mile of the dam. Jane encouraged me to fish for another hour while she planned to bike down the canyon to the pullout where we began our bike ride on Friday, and she would wait there for me to meet her. I walked down the road a bit to the same place that I’d fished in early April. During that visit I’d witnessed huge quantities of trout in the riffles of moderate depth feeding regularly on an intense blue winged olive hatch. This would not be the case on Saturday, and in fact I did not witness nor see evidence of fish during my final one hour of fishing. I converted back to nymphs with a strike indicator and worked upstream with the emerald caddis and a salvation nymph, but you could not prove to me that any fish were present in this stretch of the South Platte River. Unlike the water I’d just departed from, this location was more similar to the South Platte River near Deckers with long riffles flowing over a granular sand bottom. It was more difficult to pinpoint likely fish holding locations, so I covered a lot of water and continually moved upstream in hopes of finding a pod of fish. This hope however was dashed as 5PM approached, and I had no success. In fact I was anxious to quit as the sky grew darker and a biting wind swept down the canyon on a regular basis. I slowly drove back down the canyon as there was a decent amount of oncoming traffic, and by 5:20 I spotted Jane pedaling the opposite direction. I turned into a nice pullout, and we loaded Jane’s bike and returned to the campground where we made hot drinks and pulled on three layers to combat the chilling wind under overcast skies. It was definitely a slow 2.5 hours of fishing, but I managed to avoid a skunking and enjoyed the beauty of Eleven Mile Canyon. I reviewed the flows on my favorite Colorado streams on Monday, and the graphs definitely indicate a declining trend. Hopefully some edge fishing will be available within a week or two. I was still glowing from the excellent morning of fishing when I discovered Jane walking along the highway on her return from shopping in Viroqua. We were both anxious to undertake a canoe trip so we changed into our swimsuits and jumped in the Ford Fiesta and made the drive to Ontario, WI where several canoe outfitters were located. We traveled north through Westby and then on to Cashton where we turned eastward and drove to Ontario, WI. We were both amazed at how similar this area of Wisconsin was to central Pennsylvania. The landscape was a patchwork quilt of neat farmland. We rolled from hills to valleys, crossed small streams and encountered three or four Amish driving their horse drawn carriages on the rural roads. We also passed a few farms with horse drawn plows in action. Since Ontario is a hub for canoeing we assumed there would be numerous eating establishments catering to the tourists who flocked to this area. This turned out to not be the case as there were four canoe outfitters but only one restaurant, the Milk Jug Cafe. 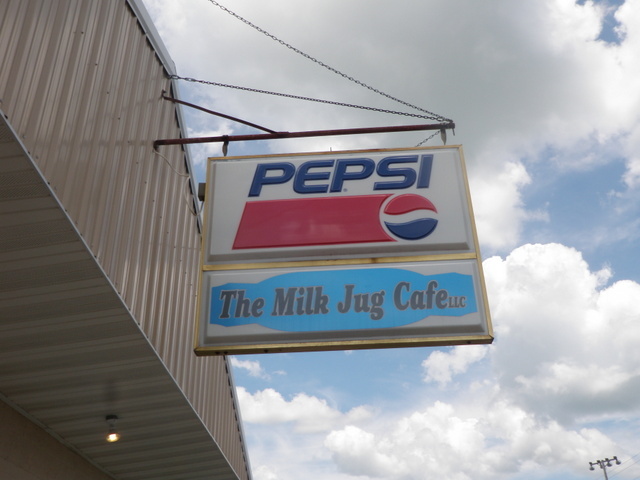 On this gorgeous Thursday, Jane and I were essentially the only patrons of the Milk Jug Cafe, and we soon discovered that it was free milk month for all of June. Jane enjoyed a free cold glass of milk with her lunch while I passed on the offer due to my lactose intolerance. For some unknown reason we selected Mr. Drifty Canoes over Mr. Duck and Titanic. Titanic didn’t convey safety to us, and Mr. Duck seemed a bit juvenile. We paid for a two hour float, and then Mr. Drifty led us to the take out at bridge four where we left our rental car. We rode back to Ontario in the Mr. Drifty van, and then we jumped in the canoe and pushed off on our river adventure. Jane claimed a seat in the bow, and that left Dave steering from the stern. We actually completed the float in one hour and fifteen minutes as we apparently did too much paddling and not enough floating and relaxing. The whole experience was delightful as there was only one mild rapid, and the only danger was avoiding the overhanging branches as the river curved and snaked through the beautiful Driftess countryside. There were numerous high rocky walls on both sides of the river that added a Tom Sawyer and Huck Finn aura to the experience. 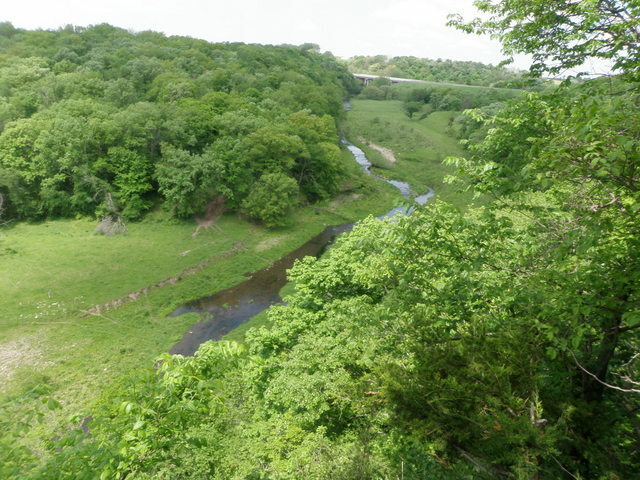 When we reached bridge 4, we dragged our canoe up the concrete ramp and left it in the grass at the top, and then we hopped in the car and returned to Viroqua. I was still riding a high from the morning fishing and enthusiastically anticipated a return to Camp Creek. Jane decided to accompany me, and I described the small Viola Park as a place where she could read for the two hours I planned to fish. I also warned her about the likelihood of persistent gnats, but she decided she could take refuge in the car if the bugs proved to be too great a menace. All went as planned, and we pulled into the Viola Park turnaround, and I prepared to fish. I was ready between 5 and 5:30 and decided to walk down the road again, and then I skipped the water that I covered in the morning and began fishing at my ending point. I tied on the Chernobyl ant and beadhead hares ear that earned my confidence in the morning and began my stint of evening fishing with renewed confidence. It was a pleasant evening with some clouds in the sky, but I fished comfortably in just my fishing shirt with no additional layers. Once again I sprayed myself liberally with insect repellant, and although I did not suffer any bites, the Off did not seem to have much impact on the tiny gnats that emerge in dense clouds on Wisconsin evenings in June. The stretch of water I fished in the evening was more akin to the water below the bridge where I began the morning session, as it consisted of many pools and short riffles with several deep bend holes. It appeared that a group had done stream improvements on the outside banks of many of the bends as a series of large boulders created a reinforced barrier to contain the stream. The boulders were constructed like a wall, and that is what leads me to believe that they resulted from a project. However they came into being does not matter, but they proved to be great fish holding areas. 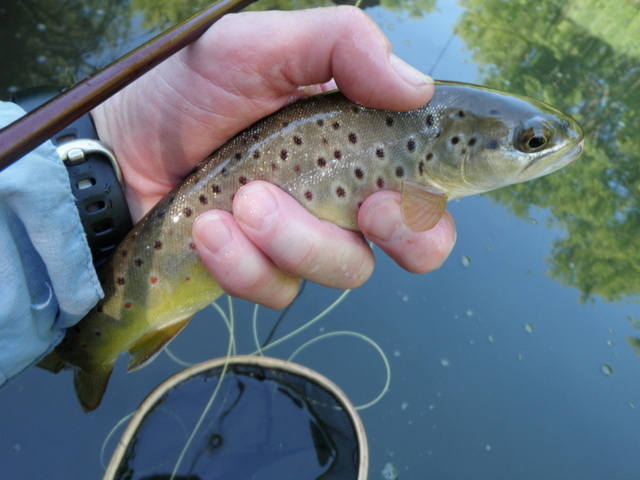 I landed six brown trout during my two hours of fishing, and at least three of them grabbed the beadhead hares ear as it drifted tight along the rock wall. Once again the slow moving sections of the pool did not produce any signs of trout, and most of the fish that showed interest in my offerings emerged from the seams and edges of faster water. I moved along quickly and jumped over the unproductive slow moving water to concentrate on the runs and riffles at the heads of the pools. Because of this rapid progress, I arrived at the barbed wire fence that runs perpendicular to the stream behind Viola Park by 7:30. I’d fished for two hours and landed six fish, and my head was surrounded by annoying gnats, so I decided to follow the fence line back to the park and call it a day. And what a day it was! I went from ridiculously low expectations including writing off evening fishing to landing 18 trout over 4.5 hours. In truth the fish were on the small side, but the water was clear and rich with aquatic weeds and reminded me of small spring creeks in Pennsylvania. Best of all the fish were receptive to my dry/dropper approach, and other than fishing dry flies to a heavy hatch, this is my favorite method of fishing. 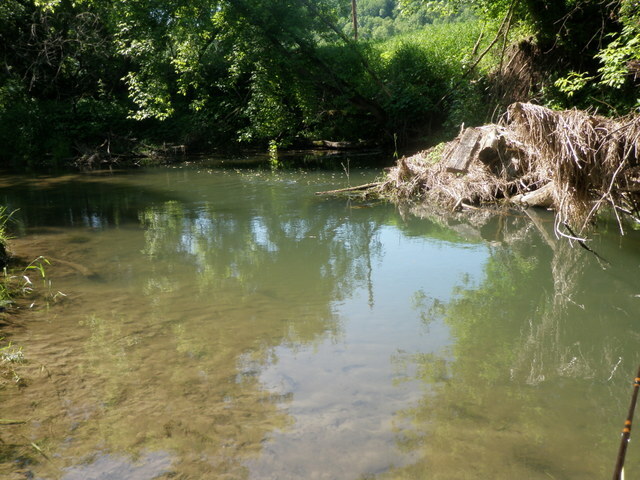 I would certainly jump at a future opportunity to fish in the Driftless Area particularly if the streams were clear and flowing at normal levels. Jane and I celebrated our wonderful day in the Driftless Area with New Glarus lagers from Dave’s Pub in Viroqua. It was an appropriate wrap up to a fun day of adventures. As I gathered my gear on Thursday morning, my expectations were frankly quite low. While I was fishing on Wednesday evening, Jane wandered up the highway to the Viroqua Hills Golf Club and decided to rent clubs and play nine holes of golf while I fished. This was welcome news as I didn’t want Jane to be bored while I was exploring the Driftless Area fishing. The first area that Danny recommended when we started exchanging emails was Camp Creek, and the fly shop highlighted this stream as well. Camp Creek was east of Viola and not too far from the Kickapoo River, and after viewing the clarity of the Kickapoo, I was somewhat concerned about the condition of Camp Creek. I was equally lacking information about the other streams on the map, so I decided to at least sample Danny’s favorite choice. I made the drive on route 56 beyond the turn off to La Barge, WI and arrived in Viola. On the way I passed Bishop Creek and the Kickapoo River, and they remained quite murky although by now a lighter shade of brown. I was already reconciling myself to a morning of drifting dark colored nymphs and woolly buggers when I passed through Viola and reached the first bridge that spanned narrow Camp Creek. Did I really see what I thought I saw? When I glanced upstream through the car window as I went over the bridge, the water appeared to be crystal clear.What had I done to deserve this good fortune? I continued .2 mile until I passed a ramshackle barn and mobile home and turned into Viola Park. Two vehicles arrived ahead of me, but one appeared to be associated with a tent camper. The other may have been a fisherman, so I decided to begin fishing back at the bridge that I had passed over assuming that another fisherman would walk directly behind the park and begin there. I sat in the grass and pulled on my waders and tied the laces on my wading boots and put together my Orvis Access four weight pack rod. I was now set and began walking back along the road until I reached the bridge where I gazed upstream and then down. 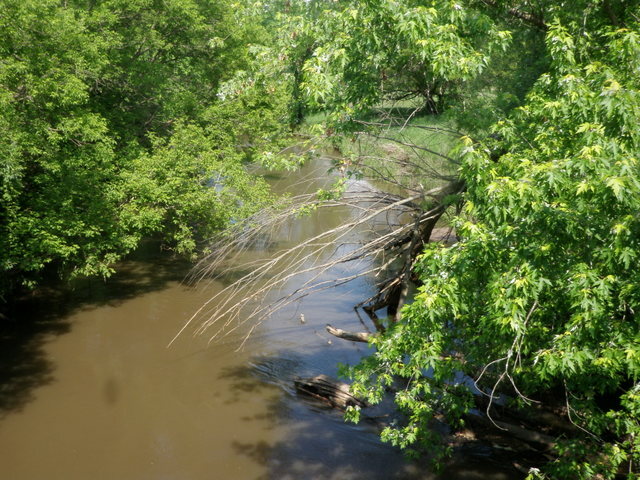 I noticed some signs on a downstream tree that indicated the water was leased for the public, and I was attracted to this area despite the tight vegetation and large overhanging tree branches. I decided to take the riskier path and whacked through some tall grasses until I reached the edge of the stream 25 yards below the bridge. I paused at this point to tie a Chernobyl ant to my line and then added a beadhead hares ear nymph as a dropper. I was now set, so I executed a roll cast upstream next to the weeds and grass on the opposite side of the narrow stream and immediately a fish rose and splashed the surface just short of the Chernobyl. I already experienced a refusal, and the water was in fact crystal clear! I was intrigued by the water downstream as it appeared to be more difficult to fish than the open water above the bridge so I once again took a calculated risk and crossed the stream and began to hack through tall grasses. I continued downstream beyond several large bends until I found a spot where I could gradually work my way to the water, and here I resumed prospecting with the Chernobyl ant and hares ear. It wasn’t long before I experienced additional refusals to the foam attractor, but then I connected on a nine inch brown and paused to take a photograph. I worked my way upstream and landed a few more browns in the 9-11 inch range, but this was accompanied by some more refusals and some momentary hook ups. In short I was having a blast prospecting a small spring creek with a dry/dropper combination with enough action to hold my interest. In this stretch of water with tight cover I worked through several very attractive deep pools at sharp bends in the stream, but much to my amazement these areas did not produce fish or even refusals. Eventually I reached the point where I had crossed below the bridge, and I began working back upstream. The water from my crossing point to 100 yards above the bridge was characterized by more velocity and a lack of deep pools and bends. I expected to cover this water type quickly, but what do I know? As things worked out, this became my most productive water of the morning. I discovered that the larger fish (11-12 inches) loved to hide under clumps of overhanging grass and vegetation. I cast the Chernobyl to the edge of the grass and as it swept by, the fish couldn’t resist snatching the trailing beadhead hares ear. I probably landed three or four nice browns using this approach. 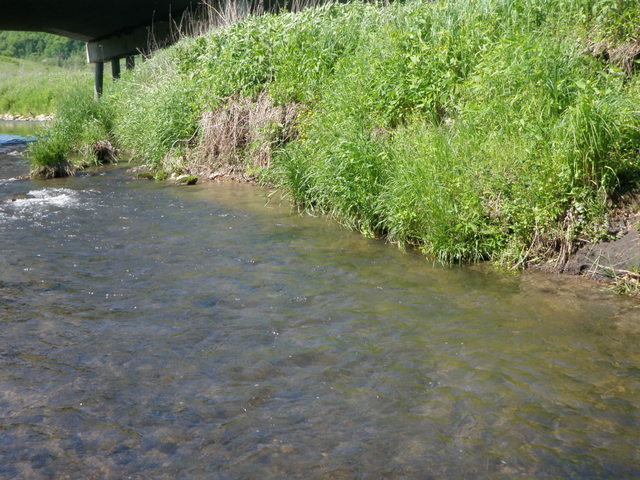 Once I passed the faster water stretch, I encountered more of a pool and riffle mix similar to the area below the bridge but without the heavy canopy because I was moving through a large open pasture. I continued to use the dry/dropper technique, but I was forced to deliver many more casts per fish landed. Much to my surprise, the large slow moving deep pools did not yield fish and most of my action originated at the heads of the pool or where the faster water fanned out into the deeper water. 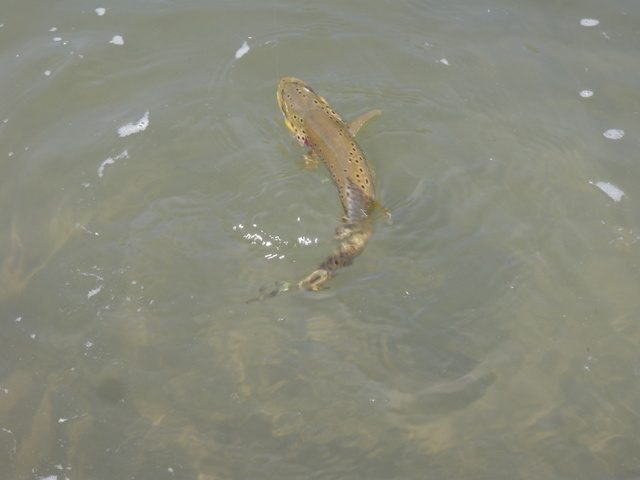 By 11:30AM I had landed twelve brown trout in the 9-12 inch range. The sun was high in the sky and beating down relentessly causing temperatures to rise into the 70’s, and the fishing action had slowed considerably. I told Jane to expect me back at the motel at around 12PM, so I called it quits and made a long return hike to the barbed wire fence that began in Viola Park. Needless to say, I was feeling quite euphoric about the Driftless Area after spending 2.5 hours in a clear spring creek and landing 12 fine fish. The fish were not overly fussy, and I had the place to myself. My plans for Thursday evening were shifting back to a return visit to Camp Creek. The antidote to fly fishing runoff blues in Colorado is traveling to an eastern location that does not experience the bloated streamflows associated with high elevation warming and subsequent melting snow. At least that was my theory when we planned a trip to Minneapolis to visit our son Dan, who has a summer internship with Emerson Electric in the land of 10,000 lakes. I read several articles about the wonderful fly fishing in the Driftless Region of Wisconsin, Minnesota and Iowa, and I decided to sample this experience. As it turned out, Dan needed to fly to Houston for training, and given his absence, it was not difficult to persuade Jane to spend a couple days in Viroqua, WI. As noted in my previous post, I met my new Instagram friend Danny Ryan at a coffee shop in Denver, and he graciously highlighted four or five streams that I could visit on my two day stay. As the streams and rivers in Colorado ballooned to dangerous levels, I clung to the knowledge that I would have a few days in the Driftless Region to partially quench my thirst for fly fishing in flowing water. Or would I? When I checked the weather map on Monday morning, the day before our scheduled departure, I noticed that Minneapolis had received 2.9 inches of precipitation. I related this to Jane, and she quickly opened her Weather Channel app and found a warning that the Kickapoo River was expected to reach flood stage by Wednesday June 4. 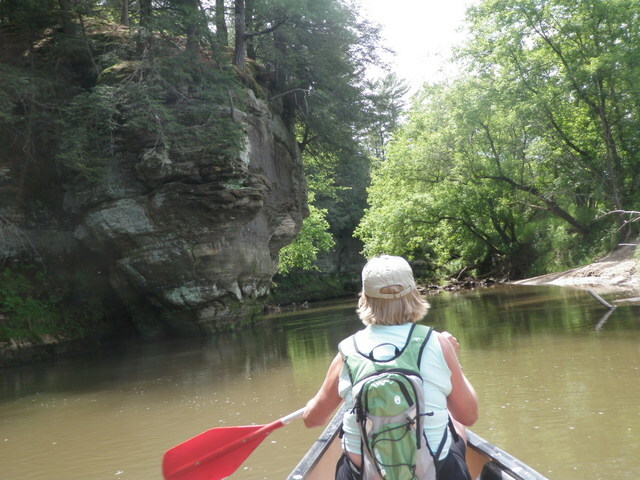 This was the very day that we planned to canoe on the Kickapoo River! My mood instantly plummeted to one of deep despair. After all the planning and excitement, I was now forced to accept the reality that heavy rain and consequent flooded muddy streams would likely scuttle my fishing plans. With this news, was it even worthwhile to lug my fishing gear from Denver, CO to Minneapolis, MN and then ultimately to Wisconsin? I decided to call the Driftless Angler in Viroqua, WI where we were staying for two days. Viroqua is near the epicenter of Driftless fly fishing, so I concluded that they would have up-to-date knowledge of the stream conditions. Unfortunately when I called twice on Monday afternoon, no one answered the phone, and I left two messages. Since the shop closed at 4PM, and I needed to decide whether to pack my fishing gear before our flight Tuesday morning, I tried one last call just before closing time on Monday. Much to my surprise a person named Sandler answered the phone, and he was quite optimistic that I would be able to fish in area streams by Wednesday. He admitted that some rivers would remain high and muddy but also felt confident that there would be some clearing and even a few stream options with near normal conditions. On Tuesday morning after I was already packed, Matt, the owner of the Driftless Angler, also called in response to my messages, and he echoed Sandler’s comments. As Jane and I boarded our Southwest Airlines flight on Tuesday morning, I remained quite apprehensive about my prospects to land any fish in the Driftless Region, but I was now committed. We spent the night in Bloomington, MN near the airport, and on Wednesday morning we began the three hour road trip to Viroqua, WI. We had reservations for two nights at the Hickory Hill Motel, and I planned to fish Wednesday evening, Thursday morning and Thursday evening, and I saved the afternoons to bicycle and canoe with Jane. The aftermath of the recent rainstorm was beautiful with mostly clear skies and high temperatures in the low 70’s. The landscape was lush green with tall grass and leaves everywhere. We stopped at a rest area in the southeast corner of Minnesota called Enterprise and took a brief hike to an overlook where I could see a small stream below, and the water was crystal clear. Could I dare to think that I would encounter similar water in Wisconsin? We continued on and crossed the Mississippi River at La Crosse and then drove southeast to Viroqua, WI. Here our first stop was the Viroqua Food Co-Operative where we bought lunch and some breakfast supplies. Next we found the Driftless Angler where I purchased an annual Wisconsin fishing license and trout stamp as well as ten flies. As it turned out, I could buy an annual license for only $1.75 more than a four day license, so I took advantage of the deal even though the likelihood of returning to Wisconsin is rather slim. Matt, the owner, was running the shop on Wednesday, so I pumped him for information and recommendations on flies. He suggested a local favorite, the pink squirrel, so I bought five of them plus two gray scuds and three black woolly buggers. I was looking for pine squirrel leeches, but they were sold out. Matt then opened the same Driftless Region map that Danny gave me and highlighted five possible destinations for me to fish with a pink marker. Did he choose a pink marker to somehow reinforce the pink squirrel idea in my brain? The streams recommended by Matt coincided almost exactly with Danny’s suggestions with a couple additions. Matt mentioned that the West Branch of the Kickapoo and Bishop Creek were likely still muddy, but he offered no such information on the other locales. Next Jane and I visited the Blue Dog Bike Shop (also the Brew Dog Coffee Shop) along Main Street in Viroqua. We wanted to rent bikes to ride in the Kickapoo Valley Reserve during the afternoon, but we quickly learned that the bike shop did not rent bike racks, so we did not have a means to transport two bikes from Viroqua to the Reserve. We decided to abandon riding in the Reserve and attempted to rent bikes to ride in the Viroqua area, but the shop closed at 3PM, and we were faced with the logistical dilemma of having to move two bikes and a rental car to the motel which was two miles south of town. We eventually gave up on the entire idea of biking and decided to visit the Kickapoo Valley Reserve and simply hike some of the trails. We departed the bike shop and checked in to our room at the Hickory Hill Motel and then changed into hiking clothes and made the 16 mile drive to the Reserve just north of LaBarge, WI. We checked in to the visitor center, and a helpful man at the counter suggested a hike from the center where there was no trail charge. We enjoyed a one hour loop and crossed the muddy Kickapoo River along the way, and this caused more concern regarding fishing prospects for Wednesday evening. Once we completed our hike, we returned to the motel, and I reviewed the map and decided to sample Bad Axe Creek. I only had an hour or two to fish, so I chose one of the closer streams to minimize driving time. I arrived at the lower parking lot of Duck Egg County Forest and parked in a U-shaped turnaround next to a small equestrian park. By the time I put on my waders, rigged my rod and doused myself with insect repellent it was 6:30PM. I ambled down to the stream by the bridge and encountered brown water that was quite opaque thus providing resident trout with limited visibility. For this reason, I decided to tie on a black conehead leech and a pink squirrel. I reasoned that the black and pink were colors that would contrast with the muddy water in the stream. 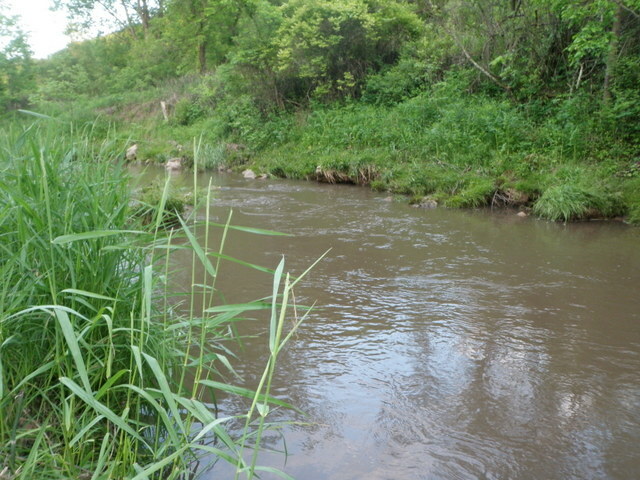 I had never fished Bad Axe Creek, and now the brown water made it very difficult for me to read the depth. There was a nice run that angled toward the opposite bank and then ran along the bank for fifteen feet, so I began drifting my fly combination along the seams on either side of the main current. Much to my surprise when the indicator was halfway down the run, it darted sideways, and I hooked and landed a feisty nine inch brown. Perhaps I was being too negative, and the fishing wasn’t bad in spite of the discolored water? I moved further upstream to a location where the water was extremely deep. I discovered this when the woolly bugger got hung up, and I waded to the far side to dislodge it. Suddenly I was standing in water above my waist, and this scared me a bit. 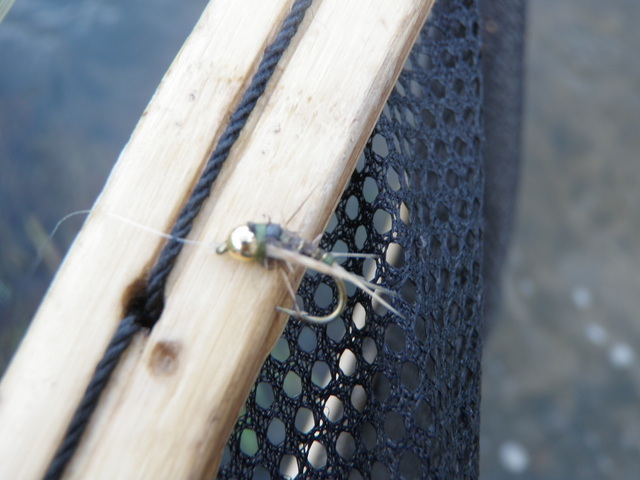 Unfortunately the conehead fly proved to be too heavy, perhaps because the bead was made out of tungsten, and I was constantly working to dislodge my flies. I abandoned the conehead bugger and tied on a pine squirrel leech, but this also got hung up in a deep area, and I broke off both flies. I now took the time to add another section of tippet and split shot and then knotted on a chocolate San Juan worm and an egg sucking leech with an orange head. After an hour of fishing these flies subsurface I still had only the nine inch brown from the very first section to show for my efforts. I decided to make a radical change and switched to a Chernobyl ant with a beadhead prince nymph below that and then a salvation nymph on the point. All three of these flies are dark in color, so I hoped that they would contrast with the brown water. By now the bugs were quite a menace as they covered my neck and face despite the presence of a heavy application of bug spray. The only positive was that they did not seem to be biting insects. Finally in some slow moving water off to the side of the main current I noticed a fish rise, and then I observed a few small blue winged olives in the air. This prompted me to clip off the prince and salvation and to tie on a soft hackle emerger to imitate a blue winged olive. After a few casts, I lifted my flies to cast again, and as I did this another nine inch brown grabbed the soft hackle, and I landed and released my second fish of the evening. I fished the Chernobyl ant and soft hackle emerger for another 15 minutes, but the light began to dwindle and the upstream path began to disappear, so I decided to experiment with some streamers in a nice deep hole. I determined that this would be my end point, but I wanted to try some old school flies that I felt would contrast with the turbid currents. First I tied on a black-nosed dace, but that did not produce any results. 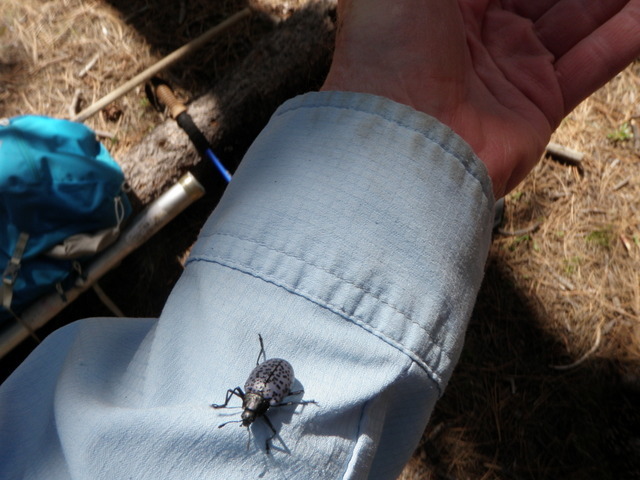 Next I discovered a slender Mickey Finn in my fleece pouch and decided to give it one last try. The red and yellow bucktail with a tinsel body should contrast nicely with the dark water, but alas it also failed to entice any trout on Wednesday evening. Because I was in an unfamiliar area, I did not want to risk stumbling back to the rental car in the dark, so I called it quits and followed the path through the woods to the small parking lot. The gnats continued to invade my ears and nose, but I’d managed to beat the odds and land two small brown trout under challenging conditions. I was prepared to give fishing one more chance on Thursday morning, but I was pretty much ruling out another evening outing as I drove back to meet Jane at the Hickory Hill Motel. 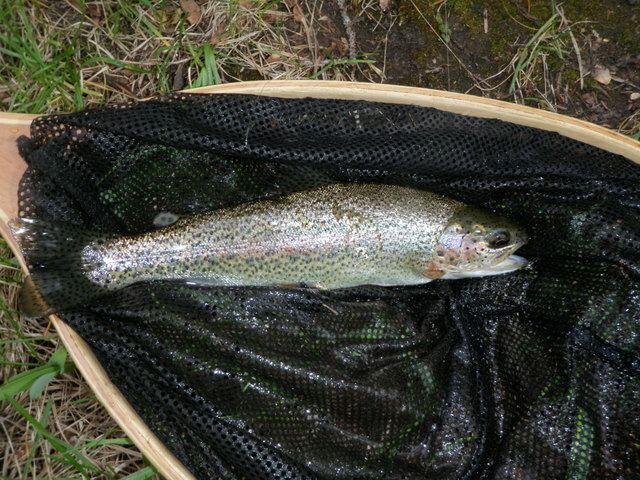 At least the Driftless Area did not totally shut me out, and I could claim that I landed a couple trout in Wisconsin. 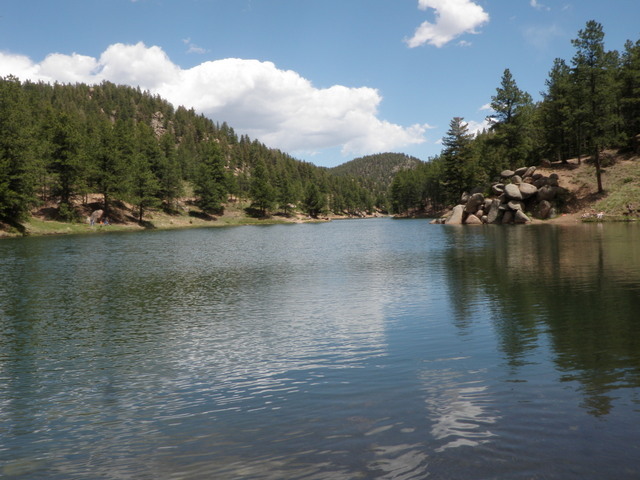 I promised myself that I would continue fishing in Colorado through the runoff time period even if it meant exploring lakes and reservoirs in the Centennial state. Selecting lakes to fish for trout is a balancing act. The lake cannot be too high in elevation, or it will remain frozen until late June or early July. Another challenge may be getting to the lake if snow and ice remain on the trail. 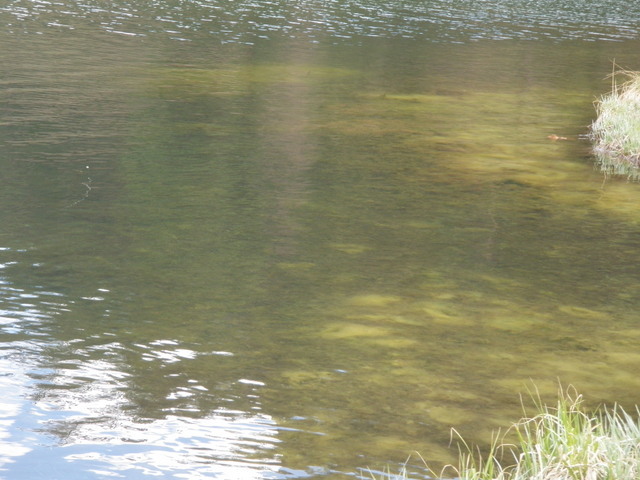 On the other hand, lakes that are too low in elevation will probably contain mostly warmwater species or stocked trout. I’m not opposed to fly fishing for bass and panfish; but I’d rather pursue coldwater species if that option exists. When my daughter Amy visited at the end of January, she introduced me to Instagram, and I’ve become a serious fan. There is a significant community of fly fishermen who are active on Instagram, and I’ve actually initiated deeper conversations with several of them. Danny Ryan is one such Instagram acquaintance, and I began exchanging comments with him because his profile indicated that he lived in Denver, CO, and he posted numerous photos from fishing in the Driftless Region of Wisconsin. Jane and I were planning a trip to Minneapolis to visit our son, Dan, and I included a two day detour to the Driftless Region in our itinerary. As a result of our Instagram dialogue, Danny and I met for coffee and tea at an establishment near our places of employment. Most of the conversation centered around fishing in the Driftless Region; however, we also digressed into a discussion of fishing in Colorado. I informed Danny that I wished to explore more lakes during the runoff season of 2014, and he was kind enough to suggest some destinations that he enjoyed. 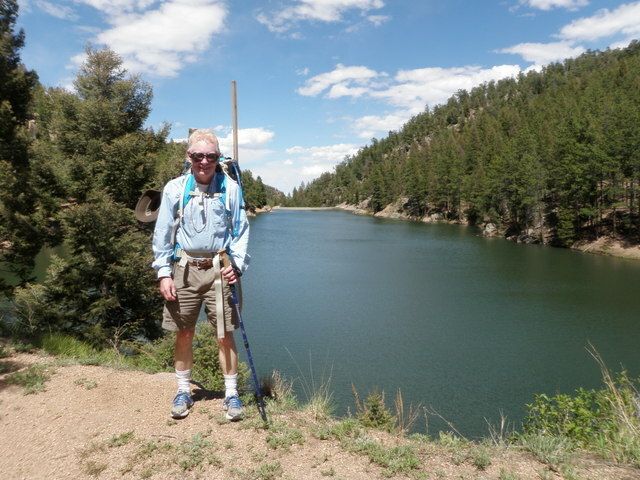 One of the lakes that he directed me toward was Palmer Reservoir near the town of Palmer Lake, CO. This interested me because it represents a shorter drive from Denver than many of my fishing favorites such as the South Platte and Arkansas Rivers. 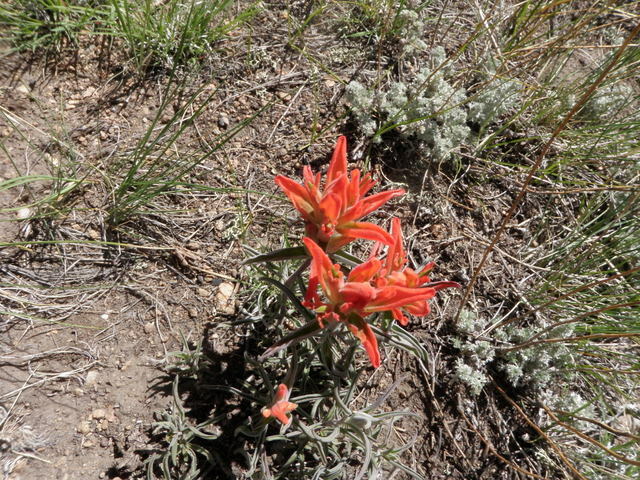 Jane was interested in joining me for some outdoor adventure on June 1, so we planned an exploratory hike to Palmer Reservoir. Unfortunately our trip got off to an inauspicious start as we heard a flapping sound as we sped east on interstate 70 no more than five miles from our house. I pulled on to the shoulder and examined the tires and noticed that the left rear tire was quite low. We exited at the first ramp and found an air pump at a gas station where I used our digital tire gauge to measure the air pressure. Sure enough three of the tires registered 35 psi or greater, but the left rear tire was at 14 psi. Even though I was certain that the tire had a slow leak, I did not want to risk driving to Palmer Lake on a compromised tire, so we returned to the house, switched our gear, and traded the Santa Fe for the Forte. Once we were underway in the Forte, we experienced no more incidents and arrived at the Palmer Reservoir trailhead by 10:30AM. I never asked Danny if wading was allowed, nor did I see anything regarding wading on any of the web sites I researched, so I packed my waders and boots and other fishing gear in a backpack. Jane and I departed the parking lot by 10:45 and after a short but steep hike, we arrived at the upper inlet area of the upper reservoir. Apparently Palmer Reservoir is a popular location in the Colorado Springs area of Colorado, as we encountered a steady stream of hikers and dogs moving in both directions on the trail. In addition quite a few of the worn fishing spots were occupied with fishermen and families tossing spinners and bait into the clear lake. Fortunately when we arrived at the upper shoreline, no one was there so we found a nice fallen log and established a base camp. The sky was a brilliant bright blue and the air temperature was probably in the upper 70’s or low 80’s. The bright sun and lack of cloud cover concerned me from a fishing perspective, and by now we’d read signs that announced that wading was forbidden. I was a bit disappointed that I lugged the heavy waders and wading boots on the strenuous uphil hike, and now they would linger in the backpack. I put together my rod and slid the line and leader through the rod guides and walked across the trail to the western shore of the lake. Almost immediately I discovered that the land bordering the reservoir was a quagmire as apparently the snow melt seeped through this area. I carefully tip toed my way around some obvious swampy spots, but even with the utmost care, I began to feel some cold wetness penetrating my socks just above the soles of my running shoes. I found some solid ground on a small point next to a two foot wide trench with flowing runoff water and tied on a damsel wiggle nymph and began to spread casts out in many directions. The articulated marabou damsel nymph did not seem to sink as rapidly as I desired in spite of some tiny dumbbell eyes, so after a reasonable trial period I snipped it off and replaced it with a size 14 stimulator with a green body. This fly was ignored just as much as the damsel nymph, and I now grew curious to explore more of the western shoreline and particularly the area where the small stream entered the lake. Unfortunately I did not want to wade through the muck in my running shoes, so I maneuvered my way back to the base camp that Jane and I created near the log on the other side of the trail. I went from chastising myself for carrying the wading boots and waders on my back unnecessarily to complimenting myself on having the foresight to bring them and gain an advantage over the other fishermen. I threw on my waders and boots and slushed through the marsh to the inlet area. The dry fly continued to underperform, so I once again decided to change tactics. I reached in my fleece pouch and extracted an olive woolly bugger with a black marabou tail and knotted this to my leader. The fly felt fairly heavy so I concluded that I had weighted it with lead wire. I began casting the weighted woolly bugger to the area where the stream entered and then gradually moved to my left until I was halfway back to the base camp. When I reached the solid ground point that I’d first used on my initial foray without waders, I stripped the woolly bugger back toward me, and as I began to lift, I noticed a fish turning away just as the streamer left the water. I had managed to grab the fish’s attention, but I was unable to tempt it to actually take my fly. I pondered this a bit, and noticed a rare caddis skitter across the surface of the lake. Why not add another fly to the bend of the woolly bugger? I pulled a beadhead bright green caddis pupa from my fleece pocket and added it below the woolly bugger. Once again I began spraying casts thirty to forty feet into the lake in spite of some strong cross winds that kicked up during this time period. I tried various speeds but on one of the hand twist retrieves, I detected a bump that transferred from the hook to my fingers. Could that have been a fish, or did I momentarily snag on a weed? I cast to the same area and repeated the same hand twist gathering of line, and this time I felt a jolt and set the hook and found myself attached to a fish. It fought and swirled and eventually I brought it close to shore and slid my net beneath a beautiful twelve inch brook trout. The pretty shimmering char displayed a bright orange belly and brilliant spots along its back and sides. I photographed my prize and gently released it into the cold clear water of the lake. I now felt renewed confidence that I’d stumbled on an effective tactic for taking brook trout from Palmer Reservoir under warm bright conditions. I continued working to my left back toward the trail with renewed focus, but I was not rewarded. But what about the area from the inlet to the point where I caught the brook trout? Surely my two fly presentation would capture the imagination of fish that ignored the solitary woolly bugger on the first pass. I sloshed back to the inlet and methodically covered the entire western end of the lake a second time. These were all solid thoughts and strategies, but unfortunately the fish did not reward me, and I decided to call it quits at 2:30. I returned to the log where Jane sat and read her book, and I removed my waders and boots and restocked my backpack. We descended the trail in 45 minutes and snapped some nice photos along the way. 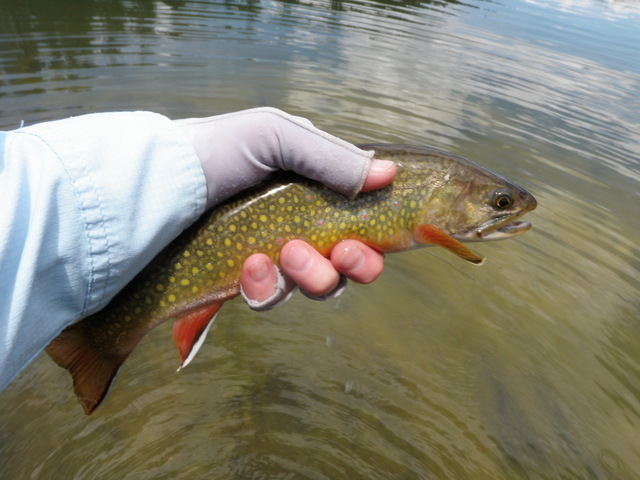 Despite catching only one colorful brook trout, it was a fun day in a gorgeous setting, and I might return during a weekday under more favorable weather conditions.